How do I know what size to get? I am happy to create pieces to your own personal measurements at no extra charge to ensure a perfect fit. If you are purchasing a gift for someone else and are unsure of their size, most designs either come with or can be adapted to include an extension chain on the clasp so that the wearer can adjust the length to suit themselves. You can place an order through the online shop by going through the procedures, or you can call directly to discuss your needs. How do I order personalised items? All items are hand made to order, so if you see a design that you like, but would like it in a different colour, or size then I will be happy to discuss this with you. There is no additional cost for this. Can I order a bespoke design? I am delighted to offer a unique bespoke design service, so if you have a wedding or special event coming up, or you desire something a little bit different, please get in touch. Hey Jules! aims to dispatch most jewellery orders within a few days, however at busy periods this may take longer. Bespoke orders may take longer than regular orders, please call to discuss. All bridal headpiece orders are custom made and will take around 4-6 weeks, so please make sure you order in plenty of time to avoid disappointment. I am usually able to accept a rush order, so if you do need an item urgently then please call. I also offer Next Day Special Delivery. Orders within the UK are sent by Royal Mail Standard Delivery, which is charged at £2.95. You are able to upgrade to Signed For delivery, or Special Next Day Delivery. Hey Jules! will often upgrade delivery method to reflect the value of the order placed. All orders over £200 will be sent by Special Next Day Delivery. Please note that this service only applies to working days (Mon – Fri) and delivery on Saturdays is not guaranteed. This can be arranged at a small fee. How will my items be packaged? 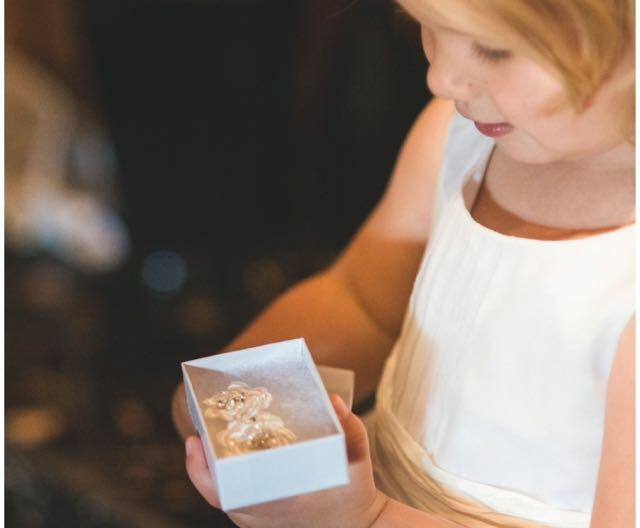 Jewellery items will be wrapped in white tissue and in white boxes, tied with satin ribbon. Bubble wrap may also be used to protect items in transit. Cufflinks are in black boxes and headpieces in black or white boxes. These are then placed in a padded envelope or a box. Can you send my order direct to the gift recipient? Yes, I can send your item direct, along with a personal message tag. Please leave your comments in the box at checkout. Our photographs represent our products accurately, however some slight variation may occur. Some designs use freshwater pearls which in their nature are slightly different hues, shapes and tones. However, designs and materials used can be agreed when you place an order, and you are welcome to request photographs before the item is shipped. The measurements listed are all approximate so slight variations will occur as the pieces are all handmade, and each one is a little bit unique! If you have particular requirements, please feel free to call me and discuss them beforehand so that your order can be made just the way you like it. I hope you will be happy with your purchase, however if an item is not suitable you may return it within 7 days of purchase and will be given a full refund. Exceptions to this are personalised items which have been created specifically for you, and earrings are not returnable due to health and hygiene reasons. All orders are carefully packaged to protect them, however if your item is found to be faulty or damaged on receipt, please contact me to arrange a return and replacement. Can I get an exchange? Exchanges can be arranged provided that the item is returned to me in its original condition within 7 days of receipt (and for bridal orders - prior to your wedding date.) This return/exchange must be previously arranged, either by phone or email. Regrettably earrings are non exchanagable due to health and hygiene reasons. Hey Jules is not liable for failure to deliver goods due to circumstances beyond our control. How do I arrange a return? Please contact me to arrange a return. Items should be returned unworn and in their original packaging with the your details enclosed. I ask that you use the Royal Mail Signed For service as I cannot be held responsible for items which fail to reach me. The return postage cost is paid by the customer, unless the item is found to be faulty. Copyright © 2019 Hey Jules! All rights reserved.